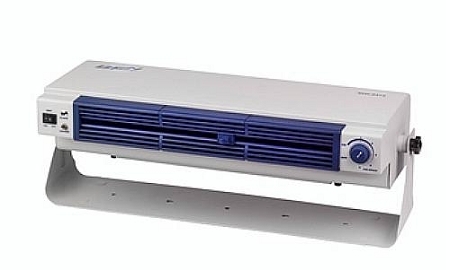 The BFN8412 is a extended Range Ionizing Blower, with AC technology which provides excellent balance and stability for secure workstation protection. Designed to cover a broad 3' x 6' area, the BFN8412 uses the AC technology to continuously produce a balance output of positive and negative air ions. This unit creates a dense and well balanced ionization current. They are unique in their ability to deliver fast decay times with low offset voltages. An integrated heater (7° F high fan and 10° F low fan), emitter point cleaner, removable front and rear finger guards, safety switch combine to make the BFN8412 a powerful and reliable ionizer. The 120 V (110 W) unit has an air volume of 50-230 CFM, an Ion Balance of ±10 V and a decay time of <1.5sec@12", 1000V-100V, High fan. The unit dimensions are 19.7" W x 7.28" H x 7.9" D.